There are activists, stylish Latinos and low riders. Bienvenido a la Misión. 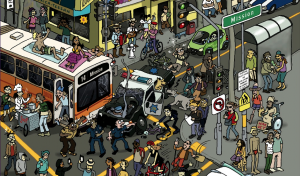 The “Comic Book Guide to the Mission,” an anthology of short comics by more than two dozen local writers and artists, out this week, offers a graphic tour through the Mission District’s history, hot spots, art and people. Chuck Whelon‘s birds-eye view of a chaotic intersection complete with traffic mayhem and street fashionistas sets the tone. The homeless character pushes his supermarket cart on the stoop, an eccentric wearing bunny ears walks his dog, drunks nurse their liquor — and all this happens while a Zip car crashes into a biker. Quintessential Mission as captured by artist Chuck Whelon for the cover of The Comic Book Guide to the Mission. Cartoonist Jeff Walker offers a pictorial walk through the Mission’s murals, and pays a visit to Precita Eyes to get a behind-the-scenes look at the making of the neighborhood’s colorful walls. In “Buy Used, Buy Bulk,” Alfred Twu draws a personal journey through the Mission’s thrift stores in search of the best breakfast bowls. In “Fourteenth & Mission,” Sean Chiki offers great snatches of history on 14th Street, like the private zoo that was there in the late 1800s. An ode to the salsa roja from The Mission Taco, a story by Omar Mamoon, art by Greg Hinkle. In “The Mission Taco,” Omar Mamoon hunts down the barrio’s best bites. And what could have been a graphic Yelp review of the Mission’s famous Mexican cuisine instead is a dramatic, over-the-top, mouth-watering homage to the best carne asada in town. But the book doesn’t only paint a glowing picture of San Francisco’s colorful neighborhood. 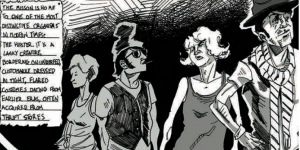 In “Down on Mission Street,” Geoff Vasile’s 30-something gives critical commentary on the Mission’s social scene. A critical look at the Mission's social scene in Down on Mission Street by Geoff Vasile. 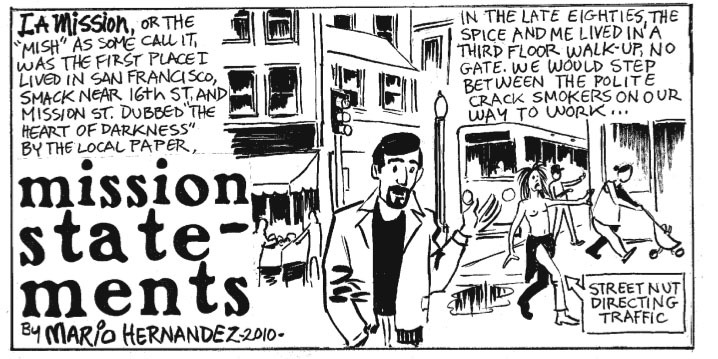 A blast from the Mission's very similar past in Mission Statements by Mario Hernandez. The anthology captures the grittier side of the Mission as well. 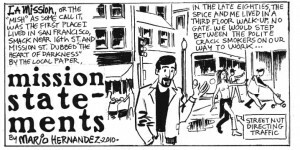 Mario Hernández, brother of the infamous Hernández brothers of “Love and Rockets,” goes back to the ’80s, when the Mission was his home and he was stepping over the homeless and watching crazy people direct traffic. The book began when Lauren Davis, 28, a transplant from Boston who writes about art and web comics, discovered that San Francisco had no comic book guide. She realized that all of San Francisco was probably too much, so she needed to narrow her focus. A year ago Davis approached a number of local cartoonists and writers and gave them the freedom to come up with their stories of and tips about the Mission. The hipster as portrayed in Field Notes from the Hipster Habitat, story by Matt Stewart, art by John Mathis. The hyperlocal comic is not completely new to Andrew Farago, curator at the Cartoon Art Museum and a contributor to the anthology. “Penny Dreadful’s Guide to the Bay,” from 2002, was a collection of work by local artists about the Bay. At last year’s Alternative Press Expo in San Francisco, Boston Comics Roundtable had local artists uncover in their city’s past in “Comic Book History of Boston.” But the maps and addresses included in Davis’s comic guide are a novelty. It’s an idea that Farago said can offer great sequels for the rest of the city. Davis is already excited to turn the Haight and the Castro into drawings. But she isn’t about to get ahead of herself. Artists who missed the deadline for this book have contacted her, eager to add their view of the barrio, Davis said. The Mission first deserves its own sequel. 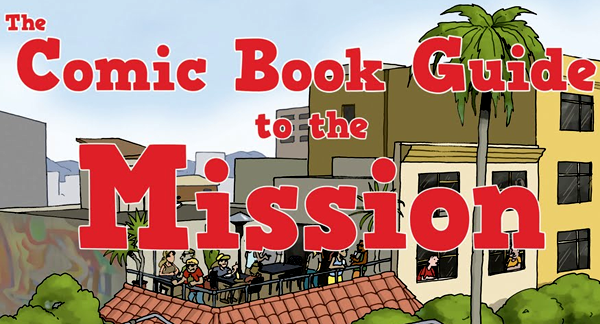 “The Comic Book Guide to The Mission,” edited by Lauren Davis. Skoda Man Press, available at Mission: Comics and Art. Dog Eared Books, Needles and Pens, as well as several other book stores and comic book stores in the city.$15. Caroline Bins recently parachuted into the Mission from Amsterdam and has already climbed into a San Francisco Municipal Transit Authority vehicle with city workers to discuss the neighborhood. One of them, Amaya, was born and raised here. She explains she used to hang with the wrong crowd and also shares her favorite Mission salsa venues with her. Um… What’s up with the 14 going down 16th Street? :/ Immediately this rag loses credibility for me. and you seem to be on to something. Let me email the artist for his response. About the 14 going down 16? A) It got spun around in the accident. B) I used some artistic license. C) I did it to specifically to annoy people. D) Congratulations! Only a true Mission-dweller would have caught that deliberate mistake. There are many more such errors in the picture, can you find all 700 of them? B) The picture just worked better that way, and it HAD to be a #14, so I used some artistic license. C) I did it specifically to annoy people who monitor bus routes. D) It was a deliberate mistake that only a true Mission-dweller would have caught – Congratulations! There are many more such errors in the picture, can you find all 700 of them?